Should you condition braid hair extensions? Here's a trick answer: you should condition your braid hair extensions if you would condition your growth hair if you weren't wearing braided extensions... and you would condition it, right? Right. Hair is hair, whether in braided extensions, under a wig or under hat and it requires some level of conditioning. Protein is used in conditioners to help repair (reconstruct) hair, however protein can also dehydrate hair (as the protein contained in conditioners absorb moisture from the hair) which means the hair can become brittle and fragile. It's always a good idea to deep condition your growth hair before you have braid extensions attached - in fact scrap that. It's more than just a good idea, it's vital if you're going to be unable to deep condition your growth hair whilst you wear braid extensions. How often should braid hair extensions be conditioned? If you wash your braids often enough, then you won't need to rub or agitate the hair in order for it to be clean; which means the braids are less likely to fray. Daily Styling: Well not quite daily, but every few days, braids can be lightly misted with a leave-in conditioner. Spray the leave-in conditioner along the length of growth hair. Be sure to maintain your braid extension moisturizing routine after using leave-in conditioner. When Washing: You can deep condition by applying conditioner to the braid extensions (only along the length of your growth hair) putting on a shower cap and leaving for 15 minutes before rinsing (detailed steps below). 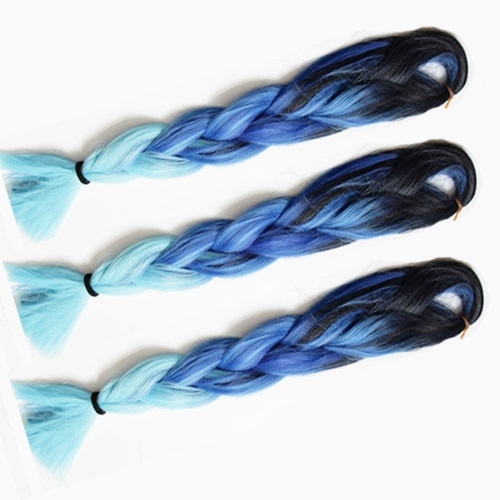 You can condition your braid extensions in the same way as you wash them. You can use this method (minus the combing) in the shower. Mix your chosen conditioner with some warm water in a container. Gently squeeze each of your four large loose braids (you can pat your scalp but you shouldn't need to rub it). lternatively, you can keep opening and closing your hand (squeezing) your braids at the same time as using your other hand to pour the shampoo and water mix over the large loose braid section. Use a spray pump filled with your moisturizer of choice and spray the parts of the braid that contain your growth hair to seal moisture into the hair. If your braid hair extensions are made of human hair, then spray the rest of the braids too. Conditioning braided hair extensions complete! There's more information in the navigation menu or you can spy on the braid extension questions asked by others in the Braid Hair Extensions Q&A section and if you still want more, you can keep up to date with the next guide about hair braiding extensions, other kinds of hair extensions, wigs and hairpieces by joining our blog – no personal info required.